They were pioneers, and they died within a few weeks of each other. Like all pioneers, they pointed the way to new discoveries and new ways of thinking. And like all pioneers, they bore the brunt of skepticism from the naysayers, the folks who do not want our vision of the world to change. They did not ask to be pioneers. That job was thrust on them by others. But during their lives, they showed the world a different view, a different perspective, a different reality from the comfortable one that has lasted for thousands of years. They were Washoe the chimpanzee and Alex the parrot. Washoe showed that a chimpanzee can learn a number of signs in American Sign Language and use those signs to communicate with people. Not only that, but she showed that she could teach these signs to other chimps, and could communicate with other chimps, using the signs. Alex showed that he could tell the differences between shapes and colors, and could use perfectly-enunciated words to communicate these differences to the people around him. Washoe and Alex were both taught by careful scientists who went to great lengths to remove subjectivity from their analyses. But neither Washoe nor Alex was merely a “lab subject,” taken out just for experiments but otherwise ignored. The people around them cared deeply about their welfare. As pioneers, both Washoe and Alex showed that animals have the cognitive capacity to use language in meaningful ways. Because the scientists were very careful with their studies, it is difficult for the skeptics and naysayers to discount the results, although it appears to be the nature of skeptics and naysayers to keep trying. And as pioneers, Washoe and Alex pointed the way to a different world. A world where we humans acknowledge that animals could have sentience and cognitive capacities that could include language. A world where we see animals as intelligent beings, rather than as objects that exist merely for our convenience. A world where animals are no longer considered as things to be used, but fellow creatures to be respected. Sometimes the days are gorgeous, balmy and calm with the sky a cloudless soft baby-blue. On such days, I am often stuck in a dark windowless auditorium, lecturing to about 100 university students in my animal behavior class. The pull of the day affects us all. I am somewhat less enthusiastic in talking about the computer-generated slides that I am showing, and the class is restless, anxious to get outside to enjoy what is left of the day. At such times, I switch into discussion mode. I start asking the class questions that can stimulate a conversation and bring out some opinions. The students usually perk up, particularly if the subject is one that really interests them. One of my favorite topics is the question: do animals think? I start off by asking, how many people believe that humans think? Usually all the hands go up, except for a few contrarians who are not convinced that anyone is capable of thought. Then I ask, how many people believe that their dog thinks? About half the hands go up. How about cats? Interestingly, perhaps a third of the hands go up. Somehow, dogs seem to have more followers than cats in the thinking category. Next I ask: how many believe that an ant can think? Almost no hands go up. Virtually everyone seems convinced that ants cannot have any thoughts. And finally, I ask: how do you know? This generates a lot of discussion that usually revolves around the difficulty of proving that anyone, human or animal, can think. The argument usually follows along these lines: I know that I can think, so by extension, I am willing to concede that perhaps other humans can think. Can I prove it? No, not really. I can provide a battery of problems to solve that seem to require thought, but I cannot conclusively rule out a stimulus-response explanation that would not require thinking. But, because I am human, I am willing to give the benefit of the doubt to my fellow humans. So why are many people not willing to give the benefit of the doubt to their fellow animals? The students in my class who have dogs usually tell stories of their dogs doing things that seem to require thought. Can they prove that their dogs think? No, not really. But they can identify with the world that dogs live in and the problems that dogs face, and are willing to give them the benefit of the doubt. But almost no one is willing to give the benefit of the doubt to ants. My students cannot imagine the world of an ant or the problems that ants might face, and are willing to accept that ants do not think. Can they prove it? No, not really. And here is the key. We are willing to accept that people think, without much proof. We are unwilling to accept that other animals think, also without much proof. Where we can put ourselves into the mind of another animal, we are much more willing to accept that the animal thinks. Otherwise, we assume that there is no thought. The assumption that animals do not think can be dressed up with all kinds of alleged scientific evidence: The brain is too small, there is no cerebral cortex, the cortex is too small, there are no frontal lobes, and so on. But the bottom line is, how do we know that an ant does not think? The answer is, we don’t. Unless we are willing to argue from definition. We can define thinking as only a human property, and then we can sit back in great satisfaction that we have solved the problem of animal thinking once and for all. Doug Von Gausig has very kindly provided two pictures of tenebrionid beetles doing headstands. Both are species of Eleodes. One species has grooves along the elytra (the fused front wings of the beetle -- remember, these are flightless beetles that walk around on the ground), and the other one has smooth elytra. Each species has defensive secretions. The grooves probably help the defensive secretions spread out across the elytra, coating them with quinones and hydrocarbons that repel predators. Interestingly, some tenebrionids have receptors that are sensitive to the breath of mammals. When these receptors register the heat, moisture, and odors of mammalian breath, the glands evert, spilling out their noxious substances. Here's a challenge for some of you beetle fans: Can you identify these two species of Eleodes? Chris Wemmer, a distinguished mammalogist and conservation biologist, suggests that it might be interesting to taste an Eleodes beetle (see comment). I don’t think that this would be a good experience. Some years ago, I was doing a study of biodiversity on one of the islands in the Gulf of California. As part of the study, I was trying to count the number and species of Tenebrionid beetles on the island. Because desert animals switch to being nocturnal during the heat of the summer, the beetles were active only at night. I set up a 200 meter transect, and walked along this transect every 30 minutes, counting the number of beetles that I saw and identifying each species. Since it was quite dark at night, I set up the transect between two large Cardon cacti (Pachycereus pringlei) that served as landmarks for me to steer by. Around midnight I stopped to pick up an Eleodes beetle that I could not identify to species. I inspected the beetle in my flashlight beam, then set it down and watched it scuttle away. During the time I was holding it, the beetle must have sprayed my fingers. I could smell the pungent, almost sweet smell of defensive secretions, but I thought that the beetle had gotten the secretions on its own body, and not on me. It was a hot July night, and sweat was pouring down my face. Without thinking, I brushed my fingers across my moustache, wiping off the sweat. Suddenly it felt like a sledge hammer hit my sinuses. It was like eating a huge dollop of Japanese wasabi (Eutrema wasabi), the green horse radish-like herb that comes with sushi, but much worse. My eyes started tearing, and liquid was flowing copiously out of my nostrils. I could barely breathe. After a few minutes, my sinuses settled down, but the worst was still to come. As I tried to walk the transect, I found that I could not steer in a straight line. I could see the Cardon at one end of the transect, and I tried to walk toward it, but I kept drifting off to either the right or the left from the straight line, without being able to control where I was walking. I tried for about half an hour, and finally gave up, sitting down in the dirt with my head in my hands. Two hours later the effect seemed to go away, and I was able to get back to my camp and roll into my sleeping bag. The next morning I was fine. Having smelled the defensive secretions of a number of different species of Tenebrionids, I can say that not all secretions have that effect. Some merely cause a watering of the eyes and a tanning response in which the skin that has been sprayed turns brown. But some defensive secretions are apparently quite potent. I try to imagine what it would have been like to taste the secretions of that beetle. Somehow, my imagination fails me. Doug Von Gausig (see previous post and comment), who is an accomplished photographer and nature recordist, sent me a video of a patch-nosed snake (Salvadora hexalepsis) excavating a burrow (watch the video). In this video, you can see some fascinating behavior. The snake goes into the burrow, apparently loops its body around some sandy soil, emerges holding on to the soil with a coil of its body, and releases the soil away from the burrow. This is an elegant solution to excavation. I have often wondered how snakes manage to dig burrows without having hands. Now I know. As I was watching the video, I was reminded of watching Sphecid wasps (genus Ammophila) excavating burrows. A wasp would go into the burrow, apparently use its legs to scrape up some dirt, put the dirt between the coxae of her hind legs, back out of the burrow, fly up into the air for about one meter, and release the dirt, which blew away in the wind as a fine plume. The wasp would do this over and over, making sure that no dirt was piled up at the entrance to the burrow as a tell-tale sign of activity for predators and parasites to notice. I tried to photograph this activity. I found a wasp that was just starting to dig her nest and set up my camera. After a few of her forays in dropping the dirt, I realized that I had a better camera angle if I moved around to the other side of the burrow. I set up the camera again and waited for the wasp to emerge. She did, and instead of flying back, she flew around on the other side of me and started searching for her burrow. At first I was puzzled, but then I remembered the classic Tinbergen experiments with wasps and pine cones. She was using me as a landmark to find her burrow, and did not realize that the landmark had moved. So she was completely disoriented. Needless to say, I moved back to my original position, and she promptly found her burrow. But back to the patch-nosed snake. I found it very interested that after emerging, the snake spent some time looking around, apparently watching for potential predators. Digging burrows must be a dangerous activity for snakes. 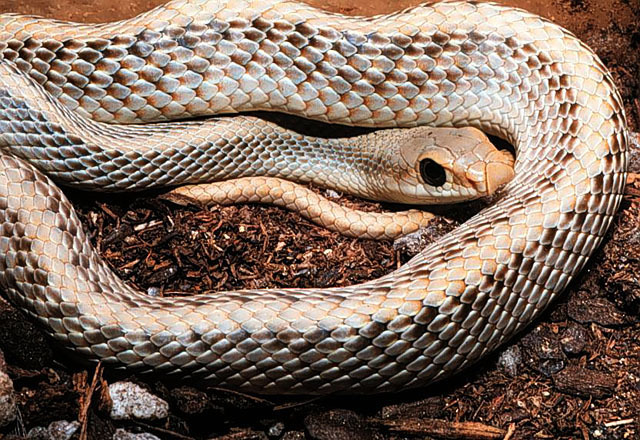 A predatory bird or mammal could sneak up on the snake when its head was inside the burrow and grab it before it had a chance to react. Watching animals like this is an excellent way of reconnecting with nature. Not only do you get a sense of what their behavior is like, but you also can get a sense of what might be important in their lives. And then you can ask yourself the question, are similar problems important to your life? Doug Von Gausig (see comment) asks an interesting question about Tenebrionids. He asks whether there are any Carabid beetles that do a head-stand display like the Tenebrionids, or if it is only the Tenebrionds that do this. The situation among these beetles is complex. There are a number of Tenebrionid beetles (many in the genus Eleodes) that do the headstand display and have defensive sections. Many of these species look very similar to one another, in an apparent display of Mullerian mimicry, where all of the species converge on a similar phenotype so that predators can learn a general color and body type and know that everything that looks like that is either toxic or distasteful. Some of these beetles have smooth elytra (the wing coverings, which in the case of these beetles are fused together because the beetles are incapable of flying), while others have grooves on the elytra. These beetles need an ample supply of moisture (that they get from eating moist vegetation or drinking dew) to manufacture the defensive secretions. When they do not get the moisture that they need, they do not do the headstand display, but attempt to run away from a potential predator. There are other Tenebrionid beetles that will also do a headstand display, but lack any capability of producing defensive sections. These are beetles in such genera as Gonasida and Stenomorpha. They look just like the beetles with defensive secretions, have the same behavior, and are found in the same places. As such, they are Batesian mimics. Batesian mimicry is where there is a model that is dangerous or distasteful, and a mimic that is edible but looks and acts like the model. Some of these species have grooved elytra while others have smooth ones, just like the species of beetle with defensive sections that they are mimicking. Then there are Cerambycid beetles, or long-horn beetles, in the genus Moneilema that mimic the Tenebrionid beetles with defensive secretions. These beetles are shiny-black, with smooth elytra, and do a headstand just like the Eleodes, but lack any defensive secretions. Unlike many long-horn beetles (who are called that because most members of that family have long antennae), these beetles have short antennae. However, their antennae are still longer than the Tenebrionids, who have really short filamentous antennae. So the Moneliema have an interesting adaptation. They have a groove running along the length of their body into which they can insert their longer antennae, making the antennae seem to disappear. One potential hitch about doing this is that there is a gray area along their body where the thorax is connected to the abdomen, and a black antenna would be visible against this gray background. To counteract this, the Moneilema have a gray segment in an otherwise black antenna, and this gray segment exactly matches the color and position of the gray area between the thorax and the abdomen. When the Moneilema do their headstand, they look just like the Tenebrionids with defensive secretions. Finally, there are the Carabid beetles. Some of these beetles are also black, and are roughly the same size and shape as the Eleodes. For example, the beetle Scaphinotus petersi looks superficially like some of the Eleodes, but runs quite fast and low along the ground, instead of walking relatively slowly like the large Tenebrionids described above. I am not aware of any of the Carabid beetles doing a headstand display. although many Carabids have defensive secretions. They seem to rely on speed to get away from their predators. Some Carabids such as the bombardier beetles (Brachinus) have defensive secretions that mix in an internal chamber and literally explode out of the rear of the beetles in a hot burst (100 degrees Centigrade) of fluids. An interesting question is how this mimicry might have evolved. For a predator to learn that a beetle is distasteful, the predator has to first taste the beetle, something that often proves to be fatal to the beetle. We have to assume that a small mutation that makes a non-toxic beetle look slightly more like a toxic one is enough to lower predation pressure on that beetle, and over millions of years the mutations that result in closer convergence are those that survive in the gene pool through natural selection. Personally, I have to marvel at how good that convergence can be in this beetle mimicry system and in other insects with Batesian and Mullerian mimicry. Moving the rattlesnake (see previous post) brought to mind the issue of transplanting prairie dogs. There are 5 species of prairie dogs in North America. Of these, one is considered threatened under the Federal Endangered Species Act, another is considered endangered, and environmental groups are petitioning the U. S. Fish and Wildlife Service to list the remaining three species as either threatened or endangered. Once upon a time, there were about 5 billion prairie dogs in the grasslands of the American West. These small groundsquirrels form the backbone of the western prairie ecosystem. By digging burrows and clipping vegetation, prairie dogs change the landscape of grasslands, providing homes for a variety of other vertebrate and invertebrate species. Some 200 species of vertebrates either depend on prairie dogs or are associated with prairie dog colonies. Many species of insects and invertebrates use the prairie dog burrows for shelter. The social structure of prairie dogs is complex, with animals occupying territories that they defend against other prairie dogs in nearby territories. They have a sophisticated system of alarm calls to predators that borders on being a language. In many respects, they are similar to people: They live in colonies called towns, they have a rich social and family life, they spend a considerable amount of time kissing each other to reaffirm social bonds, and they communicate a complex amount of information about the world around them. Along with the bison, the prairie dog is one of the icons of the American West. In many states, prairie dogs are considered pests and vermin, and are regularly poisoned and shot. Today, we have perhaps 1-2 percent of their original numbers left. Because prairie dogs eat grass, they are commonly thought to compete with cattle for forage. Never mind that in historical times prairie dogs nicely coexisted with bison, whose diet is similar to that of cows. Their burrows are thought to regularly break the legs of cattle and horses, although finding someone whose horse or cow actually broke a leg in a prairie dog burrow can be difficult. And they are susceptible to bubonic plague, a disease that people introduced into animal populations in the American West in the early 1900s. Plague kills almost 100 percent of the prairie dog colony that succumbs to it, and is a major source of mortality for these animals, along with poisoning and shooting. Throughout the American West, prairie dog colonies are being destroyed by development. Their towns are often in flat places that are perfect for the construction of subdivisions. Along the Front Range of Colorado, there were once grassy valleys with many prairie dog colonies between Denver and Boulder. Now there are subdivisions popping up all over, so that soon Denver and Boulder will be contiguous, with only signs telling the casual visitor that he or she has left one city and has entered another. As other cities throughout the range of the prairie dogs expand, the colonies either wink out of existence or become urban islands surrounded by a sea of houses. A few citizen groups are trying to save prairie dogs by transplanting them to more isolated sites, away from urban areas. This is backbreaking and often heartbreaking work. The number of sites where prairie dogs can be transplanted is very limited. In a state like Colorado, prairie dogs cannot be transported across county lines without the express permission of the county commissioners. In other states, landowners can be fined huge amounts of money if prairie dogs migrate from their land into the land of their neighbors. When transplant sites can be found, moving the prairie dogs involves countless hours of work, trapping the animals, digging new burrows, moving everyone, and providing food at the new site until the prairie dogs become adjusted to their new surroundings. While transplanting offers an immediate solution to saving animals who would otherwise be killed, we need a long-term solution to the rampant destruction of our environment and our wildlife. As our human population expands, so do the cities and suburbs. This is affecting our grasslands. Currently, there are 55 grassland species that are listed as threatened or endangered under the Federal Endangered Species Act and more than 728 species are candidates for listing. The consequences of human expansion are world-wide. Prairie dogs are among the almost 20% of all mammal species on earth today that are currently under threat of extinction. Estimates have suggested that we lose about 4 species of plants and animals per hour, or about 100 species per day, or 36,500 per year, primarily in the tropical forests. Human beings are responsible for the biggest number of extinctions since the dinosaurs died out some 65 million years ago. The expansion of human population currently seems to have little room in it for the prairie dogs. Yet, ironically, as prairie dog colonies and natural grasslands are destroyed in the name of development, the reason that many people move into newly-minted subdivisions is to escape the crowding and lack of nature found in inner cities. People enjoy the very same natural surroundings that developments often obliterate. Small parks in the middle of subdivisions are sometimes poor substitutes for nature. After a subdivision levels the surrounding landscape, the first thing that most residents do is plant trees, bushes, and grass, and set up bird feeders and ponds to attract some of the wild animals that inhabited the place. Some developers capitalize on this and build subdivisions that have a non-intrusive footprint set into the natural landscape. And here is one key to saving prairie dogs. From a pragmatic economic standpoint, developments set in natural surroundings often command higher prices than developments that are in barren, sterile and featureless landscapes. If prairie dogs can be seen as an economic attraction, they might have a chance to survive the tide of urbanization. Prairie dog colonies are fun places to watch animals. They are one of the few mammals who are active in the daytime. Unlike prairie dogs, most North American mammals only come out at night. And a prairie dog colony is a constant hum of activity. Animals chase one another. Pups kiss each other, and kiss their moms. Dads and moms stand at alert, watching for predators. Something is always going on in a prairie dog colony. In fact, zoos have found that prairie dogs are often their most popular exhibits. Rather than destroying prairie dog colonies, cities, suburbs, and exurbs can develop watchable wildlife sites, where people can go to view the prairie dogs. This can give people a sense that they can reconnect with nature, and can provide an outing for both adults and children. It can also be a source of tourist dollars, where tourists can come to watch the prairie dogs and stay to eat at local restaurants and spend the night at local hotels. And developers can charge higher prices for homes around such watchable wildlife sites, much the same way that houses near golf courses command higher prices. Golf course houses create the illusion that the house is set amid a sea of green and abundant nature. Watchable wildlife sites can create the same illusion. Also, before it is too late, we need to establish large reserves where animals such as prairie dogs and all the attendant plants and animals can live in safety. Following up on the economic theme, developers can be encouraged to build hotels and concessions at the periphery of these reserves, and tour companies can take ecotourists through the reserves on nature rides, much the same way that tourists now view large animals in Africa. Although many people have the prevailing view that we have plenty of open space, we have merely to look at the growth of the human population in states like California to see that open space is rapidly dwindling. At our current growth rate, the time is rapidly approaching when we will no longer have much open space available for wildlife. Finally, we need to continue to use legal and educational means to persuade public agencies to conserve the animals that they are charged with protecting. There are a number of citizen and environmental groups who are working very hard to ensure the enforcement of the Endangered Species Act and the dissemination of educational materials about the importance of prairie dogs and grassland ecosystems. Many of these groups operate through donations from like-minded supporters. While in theory just knowing that we are saving a piece of our heritage should be sufficient in itself, in practice it is economics that will determine how much of our heritage of plants and animals will remain for posterity. For some time, a female Western Diamondback Rattlesnake (Crotalus atrox) has been hanging around our house. She spent the winter sound asleep under our porch, and now that the weather has turned warmer, she has been emerging to enjoy the daytime temperatures. Her favorite has been to curl up underneath a low rabbitbrush (Chrysothamnus nauseosus) right next to the porch, and either snooze or delicately watch the passing scene. Sometimes a distant rabbit would catch her eye, or an Ash-Throated Flycatcher (Myiarchus cinerascens) nesting nearby would hover over her, and she would lazily turn her head from one side to another, before curling up again in a new posture of repose. Our problem was that she was curled up near our back door, near one of the main paths into and out of the house. We changed our behavior to accommodate her. Most of the time, we would go out of the front door and swing around the other door, giving her a wide berth. Sometimes we would look out the window at the back porch to see if she was out. But her camouflage is so wonderful that she disappears into the background and is extremely difficult to see, even when the distance from the window to her is less than 2 meters (6 feet). Looking for her is like looking at one of the optical illusions found in books on vision. You look and see nothing, and then you look again and suddenly she pops into view where seconds ago you could have sworn that there was just bare dirt. We tried to be respectful of her right to be there. However, we were faced with a dilemma. First, as a female, she was probably pregnant, and would soon have 4-5 babies, young rattlesnakes whose venom is just as potent as an adult’s, and who do not know yet when to bite and when not to bite. Second, as the days and nights heat up, she will become more active, and the probability of stepping on her somewhere around the house at night will become much greater. She is a good-natured snake, and probably would not bite us when we walk near her. Last year, we must have walked past her many times, sometimes centimeters from her nose, without realizing that she was there. Even now, she lets us walk to within a half-meter or less without any concern. Before I realized that she was planning to be a permanent fixture of the back porch scene, I walked out the back door, my mind engrossed in a problem, and only peripherally noticed that there was a one-meter snake lying across the porch. I stopped perhaps 15 cm (6 in) from her head. Her response was to lazily flick her rattles twice, as if to say, hey stupid, watch where you’re going! But accidentally stepping on her at night is a real concern. And while she is good natured, we have no illusions that she might not bite if someone inadvertently hurt her. Responding defensively to sudden pain seems to be a basic animal instinct. Even the most loving dogs will bite their people when hurt and in pain, not out of malice, but out of an instinct to defend themselves. We talked about what to do. On the one hand, this is her home, and we did not want to deprive her of her land and burrow. On the other hand, there was the issue of safety, both for us and for her. We had gotten quite fond of her. Could we reach a compromise that would be good for her and good for us? Finally, we decided that moving the snake would be best for all concerned. I contacted a friend who is an expert on rattlesnake behavior. She agreed to come and help with the move, bringing her tongs, padded so as not to hurt a snake and attached to a 2 meter (6 ft) pole. The tongs deftly uncurled the snake from the rabbitbrush. My friend pointed out to me that it is very easy to damage the snake’s spine, so we needed to be careful not to drop her, and we needed to pick her up so that the head end and one-third of the body was on one side of the tongs and the tail end and two-thirds of the body was on the other side. She had 10 rattles on her tail. My friend said that these snakes molt twice a year, adding a rattle each time they molt, so the snake was probably 5 years old. We placed her into a bucket, and the lid was closed. Then there was the problem of where to take her. My friend told me that studies have shown that rattlesnakes displaced even one kilometer (0.6 mi) away from their home range have a much greater chance of dying, probably because they are placed into unfamiliar terrain and are more easily found by predators, or become dehydrated from lack of cover. We decided to move the snake away from the house, some 100 meters (300 feet), into an area of rocks and bushes. The rocks had lots of crevices, and there were abundant holes underneath them where a snake could slither and hide from the sun. Nearby were woodrat nests, suggesting the potential for an abundant food supply. The snake could come out from under the rocks and bask in the bushes, while still having plenty of cover to protect her from predators. It seemed to us a perfect place for her to have her babies. My friend lifted the snake out of the bucket and placed her on the ground. The snake slithered quickly under a large rock, rattling at us to show her displeasure with being handled. Now we are hoping that she stays there. We have covered up the knot holes that she was using to get under the porch. For us and for her, the new place seems like a good solution. But will she cooperate? Time will tell. Yesterday, as I went to check my hummingbird feeder, a male Anna’s hummingbird went zooming past my face and stopped a few centimeters from my nose, hovering and looking at me. Then, apparently reassured that I was not going to tamper with his food supply, he zoomed off to a nearby tree to sit and watch for intruding males that he could chase off with vigorous displays of speed. I thought about how fast he can fly. His reaction time to obstacles in his environment is so much faster than mine. He can fly several rings around me before I can even lift my arm to my face, and he can change course before I can even comprehend where he is going. Apparently the processing time for incoming stimuli is faster in his brain than it is in mine. His physiological processes are much faster than mine as well. His heart beats around 600-1000 times per minute, while mine beats around 60 times per minute. This led to me wondering if time is the same for all animals. We humans have an average lifespan of around 70 years. A dog’s lifespan is around 10 years. A hummingbird lives for perhaps 6 years. And adult honeybees live for 30 days. Do they all perceive time the same way that we do? Is a day for us the same as a day for a hummingbird, or for a honeybee? Soon I will have to drop off my dog at a kennel, so that I can leave for a weekend speaking engagement. My dog will be there for only three days. But is his perception of time the same as mine? If a dog lives 10 years, then each of our years is the equivalent of 7 dog years, and each of our days is the equivalent of 7 dog days. Does that mean that it will seem like three weeks in the kennel for him, rather than three days? And speaking of perception, I remember having one of the old-time vinyl records of animal sounds, where a whale song was sped up 20 times and sounded like a bird song, and a bird song was slowed down 20 times and sounded like a whale. Does that mean that birds can process sounds faster than whales? I know of course that low frequency sounds (such as those found in whale songs) propagate farther than the higher-frequency sounds found in bird songs, and this is an advantage for animals that communicate over long distances. But is that the whole story? Maybe whales live longer and perceive time as being slower than shorter-lived birds. Einstein showed that time was relative to the speed that one travels. Maybe the perception of time is relative to one’s lifespan, the speed at which we live. For the Anna’s hummingbird, perhaps I am moving in extreme slow-motion, somewhere between dead-stop and barely-mobile.